My earlier article really got my mind rolling on all the inexpensive magical supplies and ritual items that I’ve made over the years. My practices have changed and I don’t use some of these things anymore, but I want to share for any of you out there who may be interested. Knowledge should be shared, right? So here’s some info on making your own runes at home. The photo at the top shows some really inexpensive glass runes that I made. Those are the flat-backed stones that people use in fish tanks or vases. They’re kind of expensive at craft stores, but if you look at chain stores or dollar stores you can often find them very cheap. You can make one set for yourself, then use the rest of the stones to make sets to sell or give as gifts. For those all I did was use a paint pen to draw the runes on, then I sealed them with clear spray. If you use a permanent marker or paint to draw the runes, you can get away with using clear nail polish as a sealer, but the paint pen will smear, so you’ll need a spray coating on those. Here’s another set in white and black with a bag that I made. I don’t have photos anymore, but there are two other ways that I have made runes. One was to use clay to make discs, then carve the rune into the clay before baking, then paint it after. If you have clay or can find it cheap, this may work for you. You can also use air-dry clay, but be aware that those will be a lot more brittle and prone to breaking. Another way, and one that’s super natural, is to go find a fallen tree branch that’s a diameter you like. Use a Dremel or hand saw or whatever you have, to cut it into slices. After that, you can burn the runes in if you have a burner, carve them in with a knife or Dremel, or paint them on. You can lacquer them or leave them plain. If you’re into runes, there’s no need to go buy expensive ones. It’s pretty easy and inexpensive to make your own. When you make your own, there’s the added benefit that your love and intention are going into them. They’re much more powerful this way than if you just buy them at a shop. 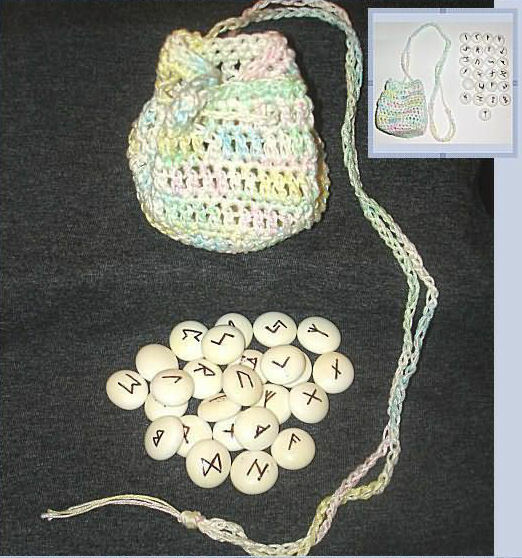 If you’ve made your own runes, please feel free to comment with photos. I’d love to see them!